For all you internet marketing cynics…. Big interests trampling on the "little guy"? What is the most irking fact about the Wikileaks saga…….. These media organisations are using the material to further their business interests and increase/maintain their readership and their positions as leading media outlets. Why is it that politicians of various colours, “powerful” interests (particularly right wing interests) in the US and elsewhere are not calling on the Owners, board chairman or CEO’s / Chief Editors of these large mainstream media organisations to face the same sanctions as those that they advocate for Wikileaks and Julian Assange? Can you imagine the uproar if an elected politician said in public that the Editor of the New York Times should be assassinated? Ignoring the big collaborators, Why? Why is it that organisations like Paypal, VISA, Mastercard, Amazon etc have acted directly at the behest of politicians to impose these sanctions against Wikileaks but don’t undertake the same actions against the large media organisations working in partnership/collaboration with Wikileaks? 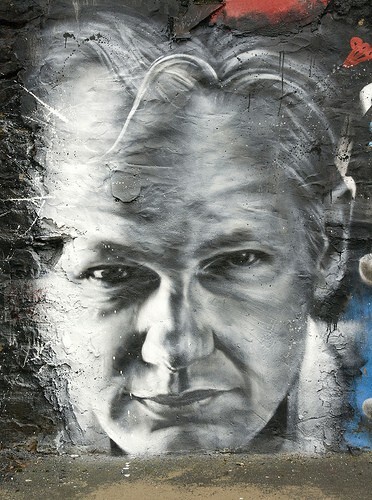 To date despite a lot of bluster Wikileaks has not been charged or found guilty of ANY offences in the US or elsewhere. It has acted as a media organisation and is simply exposing material leaked to it…. The reality is that the cache of diplomatic cables could have been delivered directly to the large mainstream media organisations and those organisations could and would have used them. These media organisations often rely on leaks and whistleblowers to provide them with the material for their “scoops”…. would the same hysteria have occurred if this material was being released solely and exclusively by a large mainstream media outlet? What are the big guys afraid of? The mosting irking factor about this saga is that it just stinks of attempts to trample on the little guy…. and the big mainstream media are complicit in this because they are benefitting immensely from the risk taking of the little guy and not highlighting the discrepancy in treatment of themselves as major players in the dissemination of the material…..
Is it just that big media interests and political interests and big business interests are TOO closely engaged to upset the apple cart, or is there some other underlying threat that the big business interests are afraid of? If it is because they are afraid of some action or potential action from Government then they should speak up about it…in the words of Thomas Jefferson..
Are even the extra-judicial sanctions too late? Is the community outrage at the attacks on Wikileaks a signal that the world has/is shifting. Are Government and business responses now a matter of trying to close the gate after the horse has bolted?? I am pleased to report that the Australian media has taken some action in regards the issue above….. with a letter being sent to the Australian Prime Minister by TV and Radio News Editors and the editors of almost every major Australian metropolitan newspaper. such action would impact not only on WikiLeaks, but every media organisation in the world that aims to inform the public about decisions made on their behalf. WikiLeaks, just four years old, is part of the media and deserves our support. It is the media’s duty to responsibly report such material if it comes into their possession. To aggressively attempt to shut WikiLeaks down, to threaten to prosecute those who publish official leaks, and to pressure companies to cease doing commercial business with WikiLeaks, is a serious threat to democracy, which relies on a free and fearless press. In the last post A New Paragidm – Election 2010 and Social Media I talked about some changes in how I engaged with the electoral process and the values that drive my deliberation. This post is a discussion about why I decided to take a more active role and support an individual candidate. Thinking local to act nationally. As far as I am concerned there are two aspects to selecting who should get your vote in a federal election. That is the quality or potential quality of the candidates representation of their local constituents and what role they can or could play in what is essentially the board of directors for your country. Traditional mainstream media, and indeed a large proportion of the social media commentary was focused on the larger picture. This is an important part of the overall equation, but if you lose sight of the local representation issue then you stand the chance of losing sight of how you and your local area will be represented in the discussion of those larger issues. When I then began to think about the local candidates and apply my values the choice became increasingly clear. One candidate (the current sitting member) had a long track record of working within and for the community both prior to and during his term in parliament. This work included accepting a role as an ambassador for the Samuel Morris Foundation, so I had observed his commitment to community first hand. The other candidate major party candidate was virtually a complete unknown who had a very limited track record of engagement in the community, and when I heard her speaking in public, clearly had a very limited knowledge of her own parties platforms and policies. As the campaign progressed a number of community forums were arranged by various community groups to discuss issues relevant to them. One candidate showed up to every single one of them. The other candidate shunned attendance at almost every community forum that was arranged. One candidate could be regularly found out and about in the community, and the other candidate seemed to only appear when senior party members with an associated media throng were in the local area. It rapidly appeared that I had a clear choice between a candidate whose values matched mine, and a candidate whose values did not appear to match. As the campaign progressed there was increasing media reporting around the potential loss of the seat by our sitting member. This was a direct concern to me because of the proven history of my local candidate, and the potential that a party that also did not match my values could obtain power. Ultimately my decision to was to become actively engaged in supporting the local candidate, and I did this in a number of ways. Through content to local newspapers, through my engagement in social media and through discussion in and around my community. As it turned out my seat became one the extremely close seats in the election. As of this post a final outcome is still to be decided in this seat, but the candidate that I decided to support is currently ahead in the count, and I am hopeful that he will hold the seat. I have recently been engaged in discussion with a national company regarding the issues of charity, cause marketing and sustainability. It started with a post at the site Mumbrella dealing with a cause related marketing project that was undertaken by 1234 (a subsidiary of Sensis who are owned by Telstra). You can find the original Mumbrella post here. I posted a comment because the story struck a note with me. What really caught my attention was the level of return to the charity involved appearing to be out of proportion to the potential value of the use of their well deserved community image. A great deal of commentary went back and forward between people on the site, including from members of the ad agency which produced the campaign, representatives of the charity involved in the campaign and representatives of 1234/Sensis. Some of this conversation was around the issues of what is cause related marketing vs sustainability vs corporate social responsibility and by default what constitutes charity. I expressed my opinion as did quite a few others, with one of the consistent threads seeking some clarity about what the rationale behind the campaign. In the comments I hope I was clear and transparent, and I declared my interest and the fact that I run another charity (which is the Samuel Morris Foundation if you are unfamiliar with me or this site). Mumbrella provided 1234 an opportunity to respond directly with a quest post to set out the company position. An opportunity that they took up in the post why Sensis believes in the cause. You can make up your own mind about the quality of the “official” response from their communications manager. What I found interesting and what I greatly appreciated was the personal response from Sensis’ head of sustainability. Jillian reached out on a personal basis offering a direct line of contact and offering a discussion about the potential of undertaking a project with the Samuel Morris Foundation. I suppose it is a question around any debate, but I don’t think this is a win/loss situation. Ultimately the original cause related marketing charity partner appears happy with the outcome of the project. Sensis/1234 have taken some positive action in relation to assisting in a social issue and a senior member of their team has reached out to a potential new partner on a personal basis and has helped make a number of people within her business aware of the work of a charity that they may otherwise not have heard about. So while there may be some debate about the original project and some of its elements the important point is that Sensis has shown a commitment to working with community partners, something which a lot more business’ should be doing. I think that on many levels this overall discussion has been a win/win. what about charity, cause related marketing and sustainability?